This little bakery was such a lucky find. After a leisurely Saturday morning walk through the Durham farmer’s market failed to turn up any gluten-free sweets, aside from the plentiful fruits and veggies, we wandered up Foster street and happened upon DaisyCakes. 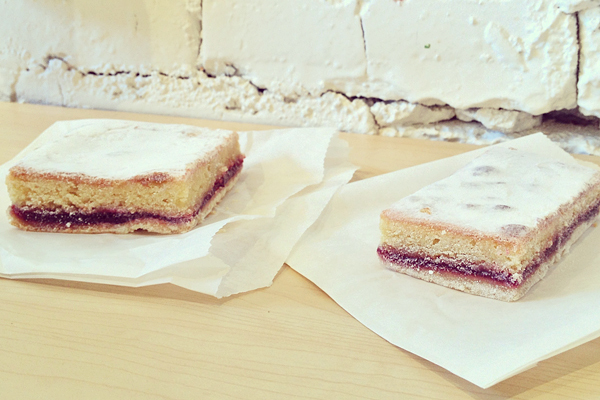 Lo and behold, the bakery was offering gluten-free raspberry almond bars alongside regular ones. This bar was absolutely divine: sweet, buttery, and crumby (and reportedly tastier than the regular version). 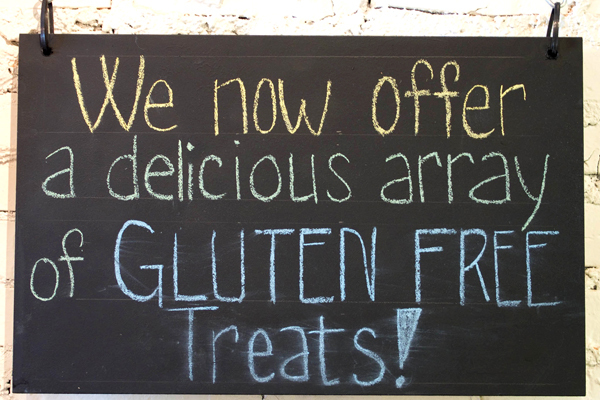 During this first visit, DaisyCakes wasn’t overtly advertising their gluten-free sweets, but by our second visit, they had expanded both advertising and offerings. On second visit, it was nearly impossible to choose. Chocolate cupcakes? 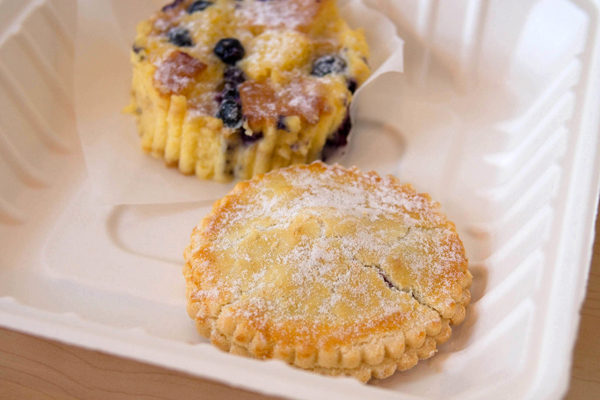 Berry tarts? 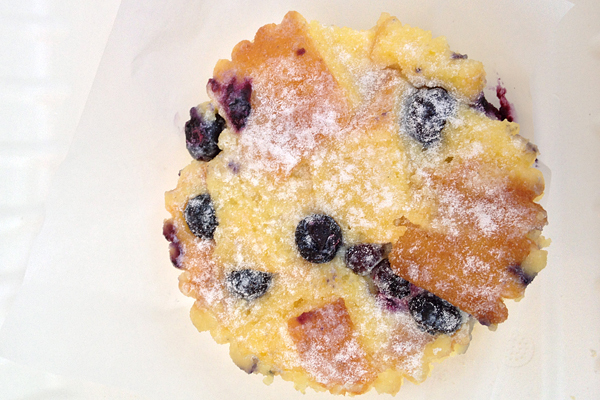 I opted for the treats I was least likely to find elsewhere: the berry pop’t art and the blueberry bread pudding. The pop’t art looked so delicious, it almost didn’t make it through the photoshoot unscathed. Not only were those raspberries perfectly juicy and covered in sweet berry goodness, but the pastry itself was also amazingly soft and buttery. An ideal combination. The blueberry bread pudding was such a novelty, I held off from devouring it for as long as I could (so, for about twenty minutes). This was by far the most decadent, richest, creamiest, to-die-for gluten-free sweet I’ve had. I can’t wait to go back for more. 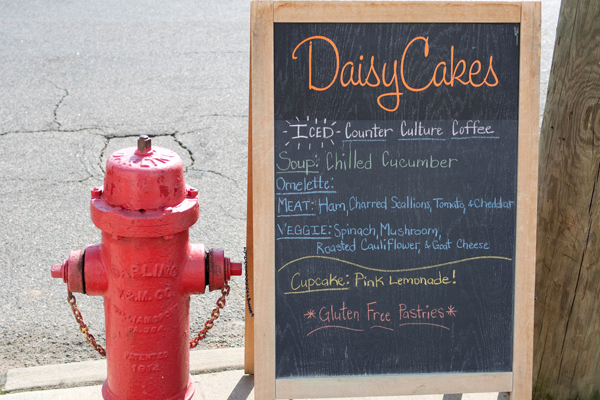 Run, don’t walk, to DaisyCakes. Where? 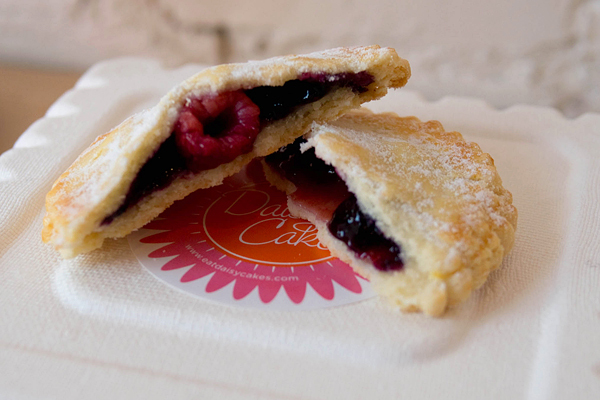 DaisyCakes is located in downtown Durham: 401 Foster Street, Durham, NC (919-389-4307).